I can only remember my Brown Pay Book with my PULHEEMS inscribed and my Confid Rec. I never heard of Red Book. Had I seen allllll my Regimental entries I might well have turned over a new leaf. I left with very good conduct and barely avoided a court martial. I had no problems in Civvy street and other guys similarly. In fact it was surprising to read in the 90's of exceptional SNCO'S falling into disaster within a year or two of demob. Homeless, Prison, Drugs, Alcoholic...Very sad. My biggest transgression in the Army: Fined £5 for going to NI to visit my then girlfriend for a weekend without permission.And caught going through a red light in Berlin when I was driving a truck as part of the alert platoon trying to keep up with the landrover in front.Fined £5.Not bad eh. Just kept my nose clean Shelldrake. I was a clerk REME so had to deal with red books and the part that determines your character assessment is governed under the above act. Entries on your regimental conduct sheet were deemed as spent after a given period of time, provided you did not commit an offense within that given time frame, therefore did not count to the assessment. The Rehabilitation of Offenders Act 1974 (c.53) of the UK Parliament enables some criminal convictions to be ignored after a rehabilitation period. Its purpose is that people do not have a lifelong blot on their records because of a relatively minor offence in their past. The rehabilitation period is automatically determined by the sentence, and starts from the date of the conviction. After this period, if there has been no further conviction the conviction is "spent" and, with certain exceptions, need not be disclosed by the ex-offender in any context such as when applying for a job, obtaining insurance, or in civil proceedings. For adults, the rehabilitation period is 5 years for most non-custodial sentences, 7 years for prison sentences of up to 6 months, and 10 years for prison sentences of between 6 months and 2½ years. For a young offender (under 18) the rehabilitation period is generally half that for adults. Prison sentences of more than 2½ years can never be spent. Other sentences have variable rehabilitation periods. Compensation orders are only spent once paid in full, but being bound over to keep the peace would be spent either at the end of the order or a year (depending which is longer). A conviction that is spent and need not be divulged under British law may not be so considered elsewhere. For example, criminal convictions must be disclosed when applying to enter the United States; spent convictions are not excluded. You will find the whole thing in widipedia, I cannot post a link yet as I am new and cannot link in the first seven days. Blimey I loved the power of the pen, even CREME consulted with me LOL. Actually CREME was easy but that guy in charge of the REME Training Center was a wise guy. He should of made General at least, not a trick passed him, and I knew every trick in the book. Hey Admin why am I now royal artillery? Power play again eh? As soon as I received my "Little Red Book" I burnt it as I found it was a useless piece of sh1te as the CO had signed it and he did not even know me.There was all but nine lines in the book and it related to my passing a class one driving test and that I was a good soldier etc etc.When I joined the bobbies they were not really interested in the book anyway as they carried out their usual checks into my character.I was successful in getting in. For a number of years I was afrighted that the MP would be trawling around where I lived, and accuse moi.... of being AWOL and take be back to serve the rest of my signed up for 22 years. I did 13 years and 9 months back in the summer of 1977. After all, was not there a reported case at the start of the Iraq escapade, tht some poor old WW2 RAF Veteran has been sent his call up papers by some jackass in MoD to rejoin the colors again. Now, this was reported in the DM (Daily Wail), now was this a true story, or just a wind up to frighten some of us old foggies that Tony Blair and Doc Gordon wanted us to do our duty to assist the Septics in their campaign against Sadman Hussien and pals....?? Talking about Military records. I had an old uncle who is long gone to pound the Heavenly Drill Parade, he was in the British Army in Ireland around the time of the Black n Tans (1920s), and was stationed in a place called Buncrana. Now part of the Republic of Ireland and not far from Derry across the border, and a favourite bolt hole for the IRA if the heat was on around Derry. It was bit curious when I spoke to my uncle back in 1972, after I came back from a tour in Norn Irn back then. Curious that he was there in 1922 in Buncrana, and I was in Derry and Newry back in 1972 - about 50 years apart. Very spooky!! As for the mention that 'siggies' didn't have a Red Book, well if you were a Regular you did, not sure what kind of discharge book NS men got. Ploughing back through this topic whilst inactive with a frozen shoulder, and just for the record which might be of little interest, NS lads were issued with Army Book 111 on discharge, I've still got mine. It's not red, but buff, about 4 1/2" X 6 1/2", and has just 4 pages inclusive of back & front covers of stout paper and bits, presumably duplicate info, which were torn out and held by the TA unit we had to join. Not a lot in it.........usual name, rank, No, etc., education, courses and a troop officer's guess of capabilities and deficiencies. Didn't know that I'd been a whiz at football until I read it, but most of the other stuff is reasonably accurate. We wanted to get out ! As I said previously,I got rid of mine but I have my fathers and my mothers discharge books.Mother was discharged in 1945 and father 1947. Still got my 111- just contains details of a few courses attended, promotions and some waffle by my OC who seemed to think ' I would be an asset to any future employer' - mayde that's why they recalled me for Suez!! didn't get another book when they discharged me after that fiasco - arrived at Borden depot on my own,late at night from Cyprus, collected some pay and a rail warrant next morning and walked out of the gate. But would you do it again Cliffo? Probably - tho I might be a bit slow around the parade ground now !. My fondest memories were of a short spell with the Gordons in Cyprus in 1956 - they treated me like a mascot and kept me in virtual alcoholic oblivion for most of the time. !! Of course, I couldn't understand much of what they said - Rucjock,- most of them came from Aberdeen! but whilst the drinks kept coming, it didn't really matter. It was they who told me that there was no such thing as a mean Scotsman --- but there were a hell of a lot of mean Scotswomen - I subsequently married a Scotswoman!! Sorry,that's restricted information, Eric - solely on a need-to-know basis --couldn't let anything as delicate as that get into the hands of the Chinese - or even worse, into the hands of the wife! 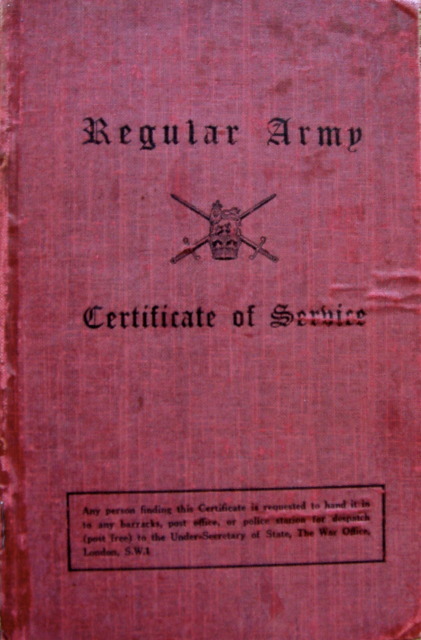 The red book as someone has already said, is a joke.It is signed by someone who hardly knows you for a start.They look at the overall picture of your service and previous reports by officers whom you have served under for the short time that they have been your pln,troop,commander etc.How on earth can they judge you as a soldier when they don't actually know you. Although I love my red book because it's a permanent reminder of my army life I know it's bullshyt. It misses out some tours, and some dates are wrong but it does say I'm a sterling chap who would make an exemplary employee for any future employer. Superb, I thought I could march into civvy street and get a job no problem with a reference like this. Oh how the people who are reading this must be laughing. LOL what a cracking post.